I thought it very considerate of him to drop the antler where we’d so easily find it. It’s the second time one of our bucks has done this: QT’s older brother Nibblet left one of his on our front lawn three years ago. Both occasions have given me a good chance to study and appreciate this simple yet complex headgear that is much more than just adornment. 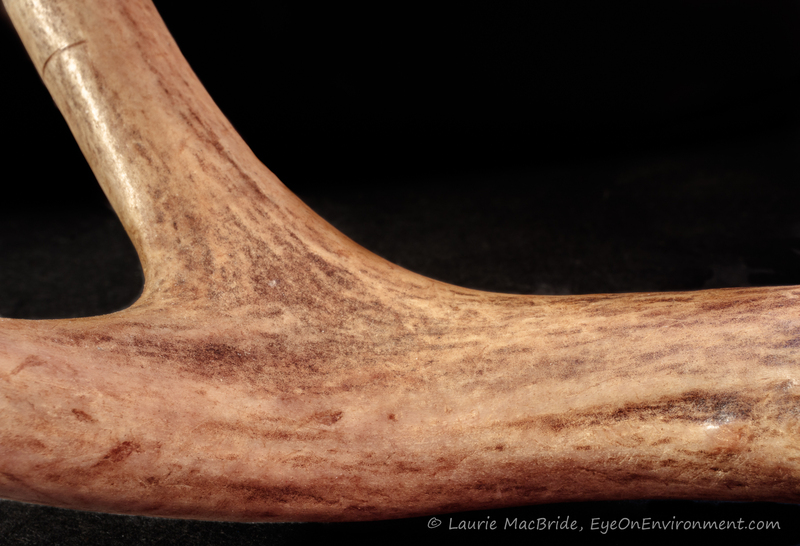 The photo above (taken with a macro lens attachment) shows the antler “burr”, the part that was attached to QT’s pedicle (one of the red spots you saw in my last post). It’s about 4 cm across at its widest point. 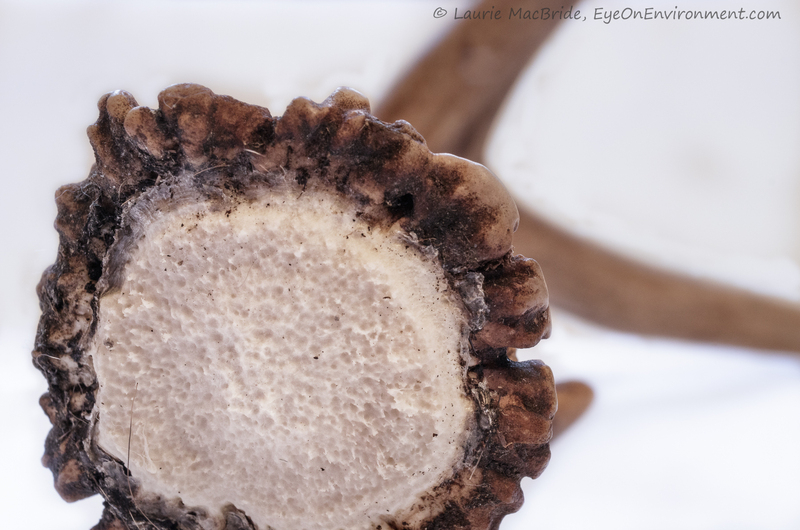 Each pedicle is unique, and remains the same throughout a buck’s life – akin to fingerprints on humans – so the rough white part of the burr shows what is essentially QT’s unique “right fingerprint”. 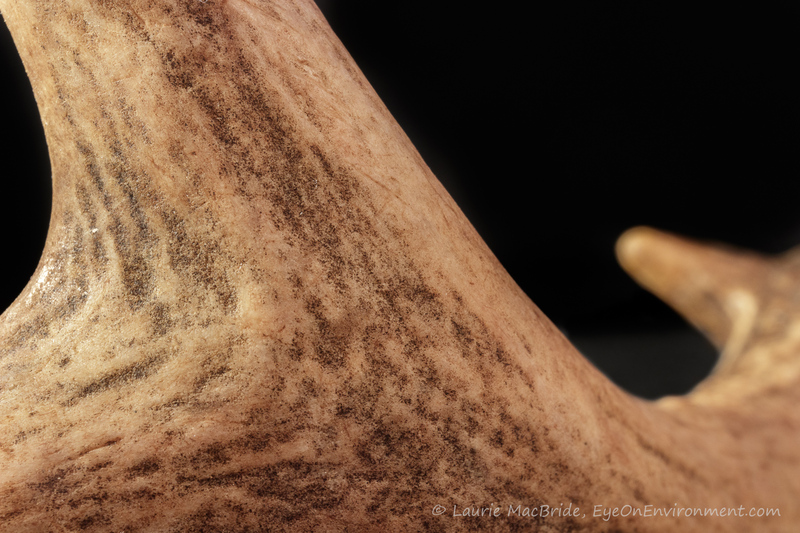 If he leaves us next year’s shed right antler, it should have exactly the same fingerprint. If we find his left antler, the fingerprint will be different. 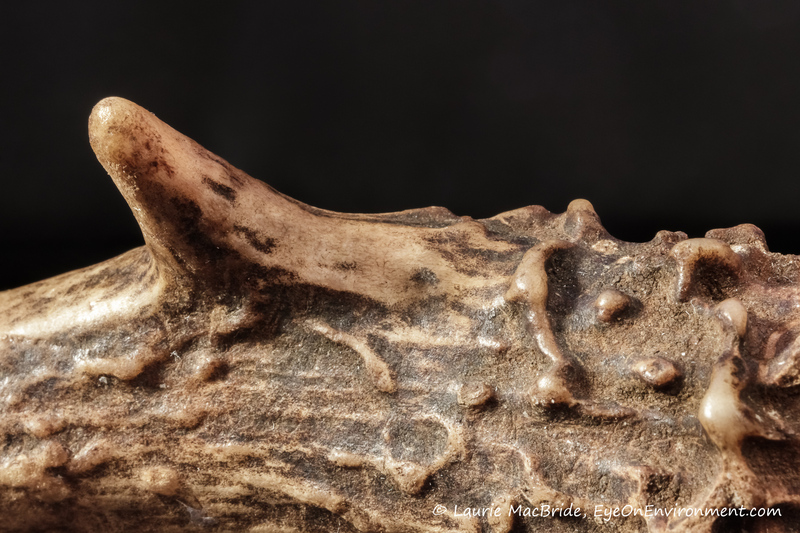 while higher up the antler, where the top tines branch out, the surface is smooth and gently curved. To give you a sense of scale, the entire antler is about 25 cm (just under a foot) high, with the top points 15 centimeters apart. This may seem small for a five year-old buck, but we live on a relatively small island and deer size seems to have adapted accordingly. We grow ’em small! Regardless of antler size, humans have made use of these bony appendages for weapons and tools, and when you get up close to one, it’s obvious how effective an antler could be for various purposes. In fact, I’m tempted to use the one Nibblet left us, a shaft with a single point, as a dibber when I plant garlic this spring. Smooth and rough, strong, sharply pointed, finely honed yet sturdy, an antler is a thing of both beauty and utility – form and function in a single package. 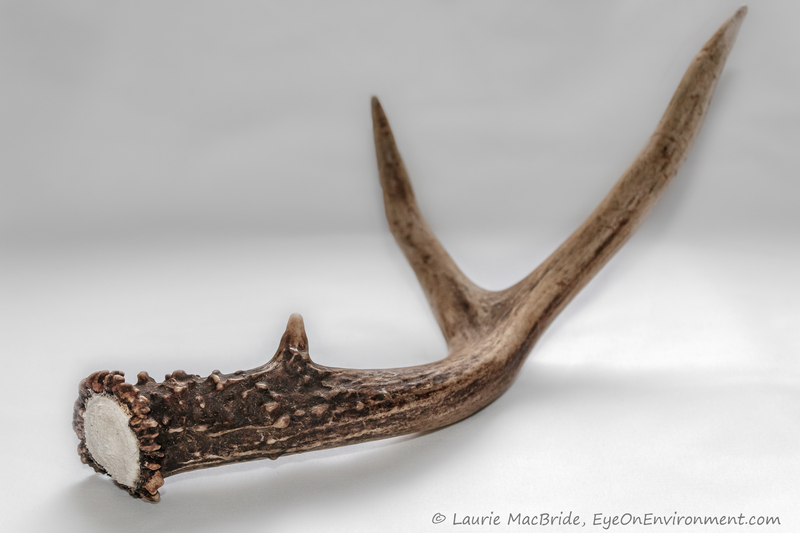 Posted by Laurie MacBride, Eye on Environment on February 5, 2019 in Animals & Wildlife, Mammals and tagged antlers, beauty, closeup, deer, macro, nature, photography, wildlife. Laurie! So, QT gave you the horn! Did some shooting around Sedona today…until the next blizzard hit. Blizzards in Sedona…not what you were hoping for I’m sure! But be glad you’re not here – a wicked windstorm last night, Arctic outflow winds and snow still on the ground from two days ago (too cold to thaw) with flurries in the forecast for tomorrow! Enjoy your blizzard, Arizona style! It is definitely a thing of beauty and utility — and how fascinating to see one close up! I learn so much from your posts. Fascinating. Thanks Sherry – and great to hear from you! Been thinking about you often lately. Hope you’re doing well.